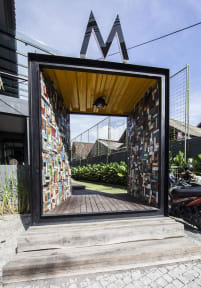 M Boutique Hostel is the first luxury boutique hostel located in Seminyak. The main concept is a comfortable place with modern pod style beds that gives a warm and relaxed atmosphere for everyone. Our priority is to provide great facilities for guests to have pleasant stay with us, such as comfortable KingKoil mattresses, clean pillow cases and bed linen, daily housekeeping, Free WiFi, Free Towel, Free Coffee & Tea, Hot Showers, 24 Hours receptionist always ready to serve you, and cozy dining area. Moreover, we also provide supporting facilities like common area with computers and TV, also some books and board games, not to mention the swimming pool and the terrace inclusive with colorful comfy bean bags as the best spot to get a chance meeting and have a chat with new friends from various countries, regions, and characteristics. M Boutique Hostel offers the 5 star services and free amenities to facilitate our guests such as : shampoo, shower gel, hot shower, 24 Hours Air Conditioning, 55' Curved TV, safety lockers, refrigerator, water dispenser, coffee & tea maker, security card access and some common medicine for first aid. For those who wants privacy, we provide each capsule with roller blind and you can ask our staffs for earmuffs if you don't want to be disturbed by any sound. This was one of my favorite hostels while traveling around Bali!! Super awesome staff who put forth the effort to genuinely get to know each guest. Thr breakfast is amazing plus they have free yoga in the morning which was fun!! the location is quite close to the market as well!! And a 5 min walk to the monkey forest!! It's just a beautiful hostel. Cheers to you Puri Garden and each staff member!!!! Pool was nice, breakfast was basic but good, beds are comfy and everything was very clean so all in all it was a nice place! Amazing hostel with a great vibe! The room was great and even though we stayed in the 43 bed dorm, the way it was laid out meant you couldn’t tell there was that many people in there. The beds were really comfy and you get two pillows, which a first for me at a hostel! There were lockers to keep all your stuff in and you needed a key card to get into the room so it all felt very safe. It was a very sociable hostel as everyone there was very easy to talk to. We wished we could have stayed longer! Such a nice hostel in the middle of Seminyak, very clean and I appreciate the cube style bunks so you can shut people out if needed. Only downside was that the dorm really lacks any natural light so you wake up not knowing what day it is, let alone time hahah. Atmosphere was a bit lacking for a solo traveller, no real place for people to hang out and meet aside from the the pool and the wifi is a bit patchy in the dorm. Other than that, a really nice place with all the facilities you need. The host was very helpful in advising me best transport options for when I arrived at the airport. The security is great with own locker and key card provided. The pods were cosy and beds extremely comfortable. Came as a solo traveller and ended up spending my couple days with a fellow member. Extremely impressed with free water bottle refills. 10 min ish walk to the beach, would stay again to explore seminyak further. Its a great place for a night or two. Its in the heart of the busy night life of Seminyak. The pods are great, its clean, the pool is great. Breakfast is toast, coffee, or tea. Overall a solid choice for Bali. Rooms are exceptionally clean and loved the facilities. Pool area is nice, and free tea and toast in the morning is good. Staff helped us organise transfer to Gili which was great. Only issue was the bathrooms needed redoing or fixing up, a lot of broken stuff and wasn’t very clean. Also the bed sheets and towels had stains on. Would stay here again. Not really much going on here. Looks great but dead atmosphere. Facilities are great and free breakfast is a winner I would stay here for only one night and if you're looking to relax.